Slip into the soothing comfort of the Vionic with Orthaheel Technology Selena. 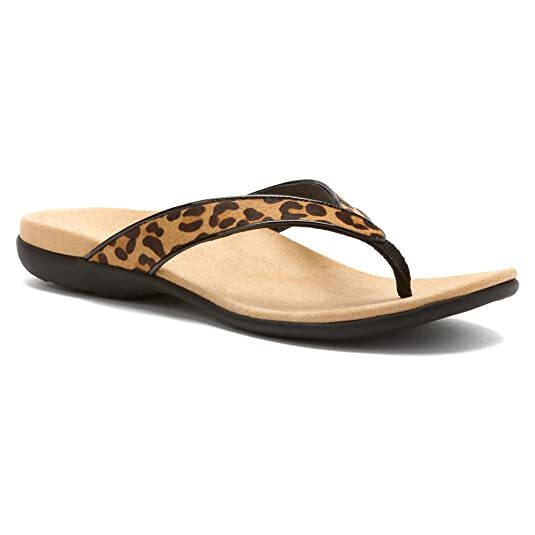 This womens thong sandal features a printed haircalf upper with sophisticated patent piped edging. The footbed of this sandal is a Podiatrist-designed bio-mechanical orthotic one that puts your foot back to its natural position. It comes with an EVA midsole that is lightweight and flexible and keeps your feet relaxed by absorbing shock and relieving pressure. The durable outsole is made from rubber and features a patterned tread that provides traction on a variety of surfaces. These amazing sandals are clinically proven to help relieve common causes of heel and knee pain. Get the Vionic with Orthaheel Technology Selena sandals and feel the difference. Add luxury to your step with the amazing Vionic with Orthaheel Technology Ramba sandal. Crafted with rich leather and embellished with a multiple strap design for added appeal, this striking thong sandal is perfect for the warm season. Its podiatrist-designed, biomechanical orthotic footbed with deep heel cup helps support and realign feet back to their natural position. 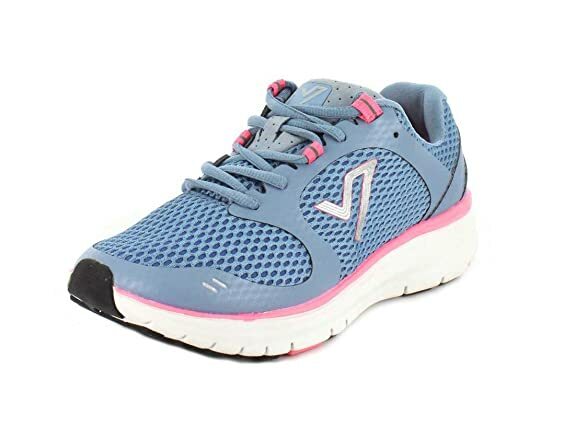 Its Lightweight, flexible EVA midsole absorbs shock to reduce pressure on the feet, ankles and knees, while rubber outsole with wave pattern trim provides sure traction that grips where and when you need it the most. Clinically shown to help relieve common causes of plantar fasciitis, heel pain and knee pain, related to over pronation and flat feet, this sandal is sure to change your walking habits completely. Pair the Vionic with Orthaheel Technology Ramba with any casual outfit and get ready to experience comfort like never before. 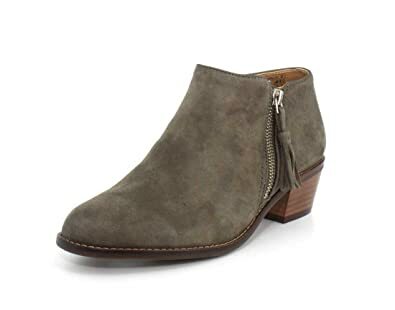 Revitalize your look with the on-trend Rory ankle bootie. Smooth leather uppers with an almond toe. 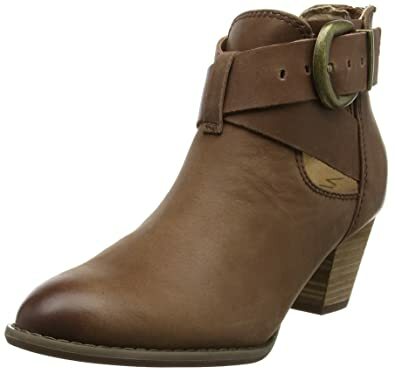 Crisscrossing straps at front of ankle with an adjustable buckle at side. Rear zipper closure for an easy on-and-off. Soft microfiber linings. 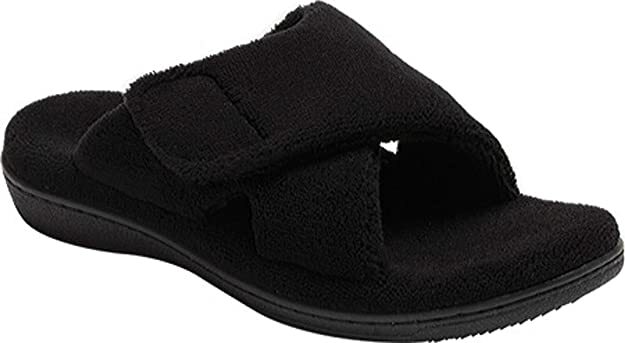 Features a removable, microfiber-lined EVA cushioned footbed for all-day comfort and support. 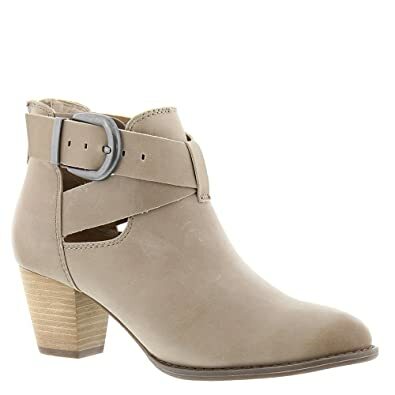 Stylish stacked heel. Durable rubber outsole. Imported. Measurements: Heel Height: 2 in Weight: 12 oz Product measurements were taken using size 7, width M. Please note that measurements may vary by size. 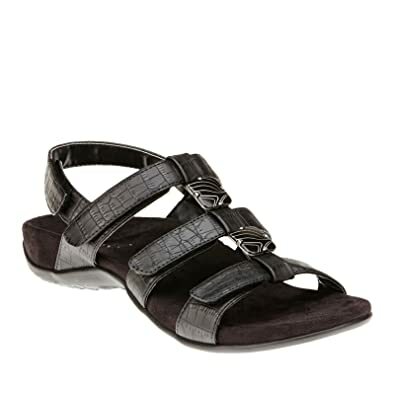 The Vionic with Orthaheel Technology Eve womens sandals are a blend of fashion and comfort. 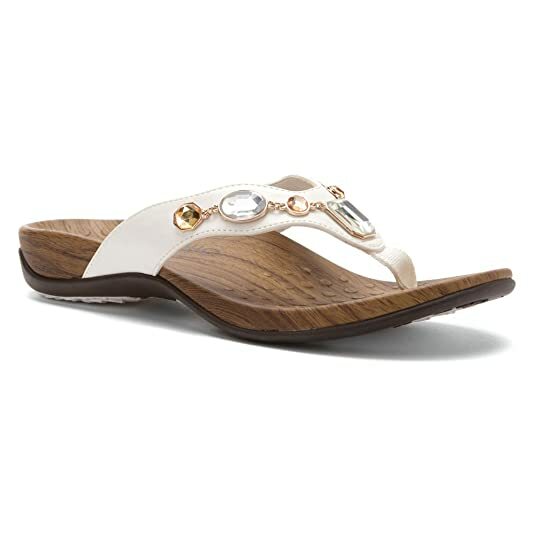 This sandal is made with a polyurethane upper and features faux jewel decorations and a soft webbing toe post. The podiatrist-designed biomechanical footbed in this sandal comes with deep heel cups that enhance natural stability. Its EVA midsole being flexible and lightweight, helps reduce pressure on the feet, ankles, and knees. The EVA outsole has a microfiber covering with a wave-patterned tread that offers good footing. Whats more, these sandals are clinically known to help ease common causes of heel pain and knee pain. Get the Vionic with Orthaheel Technology Eve that combines style and functionality. The Lizard-printed leather upper of the Vionic With Orthaheel Allora make this statement shoe flat-out fabulous. 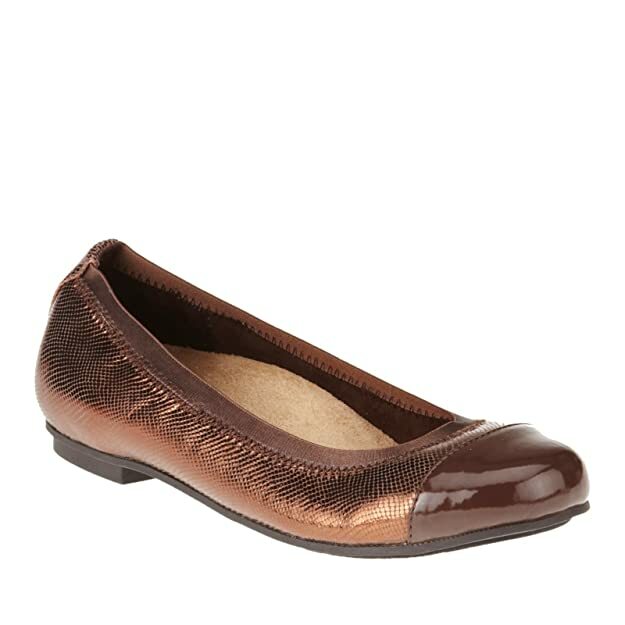 Boasting of a man-made patent toe cap that shines for dazzling appeal, this beautiful flat features a satin finish elasticized top line that offers exceptional comfort. Durable rubber outsole provides all-day traction while Orthaheel Footbed Technology naturally aligns your feet and helps relieve heel pain by reducing over-pronation. Ideal for everyday use. Add comfort and style to your daily look with the new Vionic With Orthaheel Allora.This style fits small. We recommend ordering a half-size larger than your typical size for optimum fit and comfort. With a sweet shorter vamp design and signature metal saddle trim, the Sydney loafer is a classic driver with modern appeal. Boasting of multiple technologies for added comfort and ease, this amazing flat rests on top of a durable, ground-gripping rubber outsole that provides all-day traction. 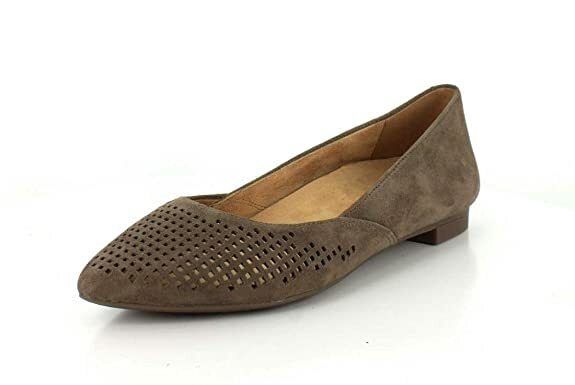 Its padded footbed with Orthaheel Technology naturally aligns your feet and helps relieve heel pain by reducing over-pronation, while beatable leather lining wicks moisture away for maximum convenience. Sure to become your favorite go-to shoe. The Vionic With Orthaheel Sydney will upgrade your stride with unprecedented comfort and style. If you are a half size, VIONIC® recommends ordering the nearest size down. Take it easy and unwind in the designed-for-comfort Relax Slipper from Vionic®. Received APMA Seal of Acceptance. Click here to view Seal. Plush fabric upper and liner surrounds your feet in complete comfort and warmth. Fully adjustable hook-and-loop closure across the instep. Fabric-covered footbed is treated with antibacterial, odor-resistant Ecofresh to keep your feet feeling fresh. Lightweight, flexible medium-density EVA midsole absorbs shock to reduce stress on the feet, ankles and knees. Durable TPR outsole with wave-patterned tread provides traction to maintain your confident stride. Imported. To clean, wipe away dirt and dust with a dry cotton cloth. Commercial dry cleaning or home wash/dry laundry machines are not recommended. Measurements: Heel Height: 1 in Weight: 8 oz Product measurements were taken using size 8, width M. Please note that measurements may vary by size. Step into the spotlight in the Vionic with Orthaheel Technology Tide Sequins. This podiatrist designed sandal has a unique sequin-covered textile upper with a soft lining that feels good on your feet. It has a biomechanical orthotic footbed that comes with arch support and a deep heel cup, along with a dotted design to provide better grip and stability with every step you take. The EVA midsole is firm and flexible and the rubber sole, comes with a geometric tread pattern for better traction on different surfaces. This webbing toe post sandal can even help you recover from foot pain, heel pain, knee pain, and aching legs. Your quest for a healthy footwear stops with the Vionic with Orthaheel Technology Tide Sequins. 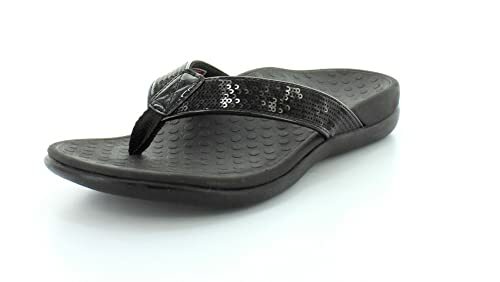 This sandal is available in full sizes only. We recommend ordering a size down if you are a 1/2 size. The Posey flat is pretty and perfect for any occasion. Suede uppers with laser cutouts at front and a pointy toe. Easy slip-on style. Soft microfiber linings. Soft, microfiber-lined EVA footbed for added comfort. Durable rubber outsole. Imported. 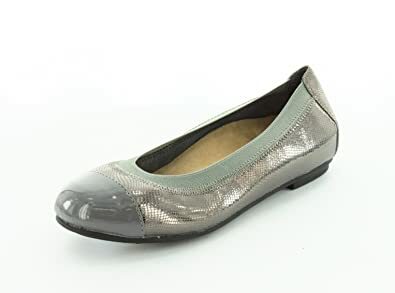 Measurements: Heel Height: 1⁄2 in Weight: 6 oz Product measurements were taken using size 7, width M. Please note that measurements may vary by size. Take in the sunshine along with compliments and comfort in the Orthaheel Technology AMBER sandal from VIONIC.